In Industrial Microbiology, microbes are used to synthesize a number of products valuable to human beings. This industry has provided products that have deeply changed our lives and life spans. There are various industrial products that are derived from microbes such as beverages, food additives, products for human and animal health, and biofuels. Microbes especially yeast have been used from time immemorial for the production of beverages like wine, beer, whiskey, brandy or rum. 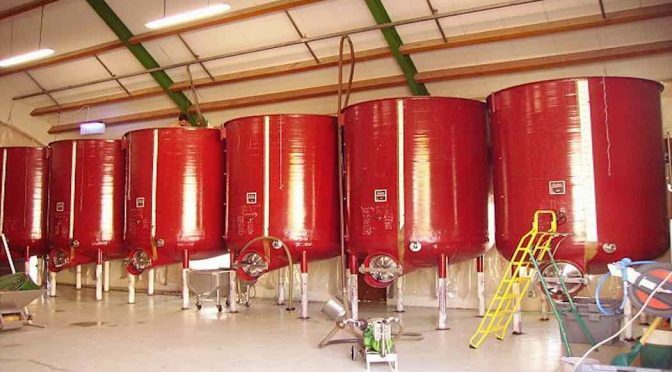 For this purpose, the yeast Saccharomyces cerevisiae (commonly called Brewer’s Yeast) is used for fermenting malted cereals and fruit juices to produce ethanol. Microbes are important agents in the Beverages Industry. 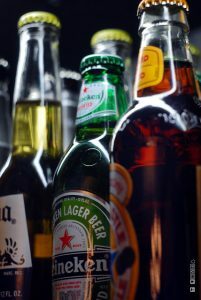 Among these beverages, Wine and Beer are produced without distillation whereas whiskey, brandy, and rum are distilled beverages. Antibiotics produced by microbes are regarded was one of the most significant discoveries of the twentieth century and have made major contributions towards the welfare of human society. Microbes are also used for the commercial and industrial production of certain organic acids. These compounds can be produced directly from glucose (e.g. gluconic acid) or formed as end products from pyruvate or ethanol. Examples of acids producing microorganisms are Aspergillus Niger (a fungus) of Citric acid, Acetobacter acute (a bacterium) of Acetic Acid, Lactobacillus (a bacterium) of lactic acid and many others. Amino acids such as Lysine and Glutamic acid are used in the food industry as nutritional supplements in bread products and as flavor enhancing compounds such as Monosodium Glutamate (MSG). 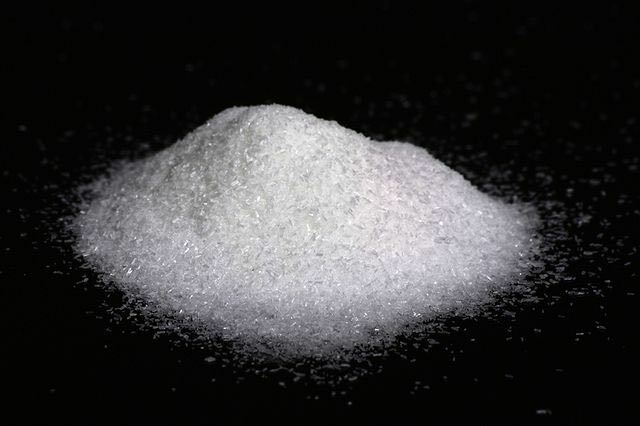 Crystals of the food additive monosodium glutamate (MSG). Amino acids are generally synthesized as primary metabolites by microbes. However, when the rate and amount of synthesis of some amino acids exceed the cell’s need for protein synthesis, then cell excrete them into the surrounding medium. Many microbes synthesize and excrete large quantities of enzymes into the surrounding medium. Using this feature of these tiny organisms, many enzymes have been produced commercially. These include Amylase, Cellulase, Protease, Lipase, Pectinase, Streptokinase, and many others. Enzymes are extensively used in food processing and preservation, washing powders, leather industry, paper industry and in scientific research. Vitamins are some organic compounds which are capable of performing many life-sustaining functions inside our body. These compounds cannot be synthesized by humans, and therefore they have to be supplied in small amounts in the diet. Microbes are capable of synthesizing the vitamins and hence they can be successfully used for the commercial production of many of the vitamins e.g. thiamine, riboflavin, pyridoxine, folic acid, pantothenic acid, biotin, vitamin b12, ascorbic acid, beta-carotene (pro-vitamin A), ergosterol (provitamin D). Organic solvents such as ethanol, acetone, butanol, and glycerol are some very important chemicals that are widely used in petrochemical industries. These chemicals can be commercially produced by using microbes and low-cost raw materials (e.g. wood, cellulose, starch). Yeast (Saccharomyces cerevisiae) is used for commercial production of ethanol. This alcohol is used as motor fuel and is often referred to as green petrol. 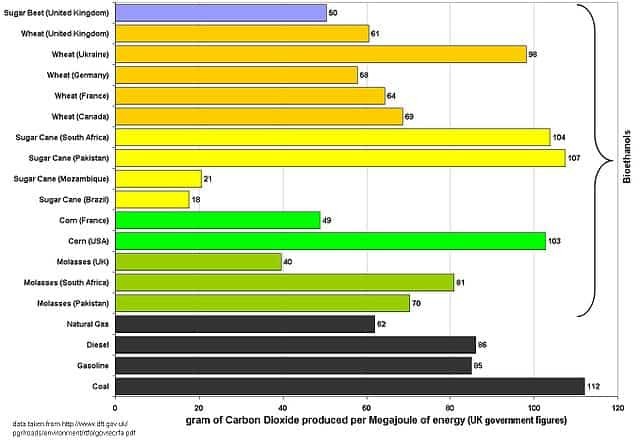 Various sources used for the production of bioethanol in different countries of the world. Single Cell Protein (SCP) can serve as an alternate source of energy when a larger portion of the world is suffering from hunger and malnutrition. Single cell proteins are microbial cells that are rich in protein content and can be used as protein supplements for humans and animals. Microbes like Spirulina can be grown easily on materials like waste water from potato processing plants (containing starch), straw, molasses, animal manure, and even sewage, to produce large quantities and can serve as food rich in protein, minerals, fats, carbohydrate, and vitamins. Also Read: What are SNPs? Why are Scientists interested in them? These are a very important group of chemicals, which are used as anti-inflammatory drugs, and as hormones such as estrogens and progesterone, which are used in oral contraceptives. Steroids are widely distributed in animals, plants, and fungi like yeasts. But, producing steroids from animal sources or chemically synthesizing them is difficult, but microorganisms can synthesize steroids from sterols or from related, easily obtained compounds. Vaccines are also a product of industrial microbiology. Many antiviral vaccines are mass-produced in chicken eggs or cell cultures. The production of vaccines against bacterial diseases usually requires the growth of large amounts of the bacteria. Recombinant DNA technology is increasingly important in the development and production of subunit vaccines. Many pharmaceutical drugs are also produced by microbes e.g. Cyclosporin A, that is used as an immunosuppressive agent in organ-transplant patients, is produced by the fungus Trichoderma polysporum. 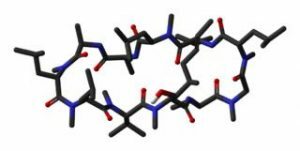 Neutron structure of the immunosuppressant cyclosporin A.
Statins produced by the yeast Monascus purpureus have been commercialized as blood-cholesterol lowering agents. It acts by competitively inhibiting the enzyme responsible for the synthesis of cholesterol. Prescott, Lansing M, John P Harley, and Donald A Klein. Microbiology. Dubuque, IA: McGraw-Hill Higher Education, 2005. Print. Slonczewski, Joan, and John Watkins Foster. Microbiology. New York: W.W. Norton & Co., 2009. Print. Pelczar, Michael J, E. C. S Chan, and Noel R Krieg. Microbiology. New York: McGraw-Hill, 1993. Print. Previous PostWhat are the different Causes of Antibiotic Resistance?Next PostHirudo medicinalis – An Old Medicine is New.